Sometimes Hollywood just makes sweet movies. Not often. Just sometimes. These are the movies that you remember from your youth, not completely great films, but kind-hearted ones where people’s common humanity is celebrated, where decency is rewarded, and where foibles are accepted and embraced, not pilloried in some sort of zero-sum football match – loving, slightly creaky movies you would have discovered at the far end of the television dial, some weekday afternoon, when you were home from school sick with the flu. Two such movies are rolling through your local cineplexes now, quietly charming audiences in the shadow of more cynical, merchandisable fare like Suicide Squad. I happened to catch Florence Foster Jenkins and Pete’s Dragon in a double feature on a warm summer weekday afternoon, no flu required, and I’m glad I did. Perhaps surprisingly, Pete’s Dragon is the much stronger film. The original 1977 Disney film combined one-dimensional animation, even more one-dimensional performances (who thought Helen Reddy was a good idea? ), and treacly songs (“Candle on the Water,” anyone? nah, I didn’t think so) into a forgettable diversion consistent with the Mouse House’s lousy Me Decade offerings (Apple Dumpling Gang … blech). Years pass, and Pete and Elliot carve out a pastoral existence, spending their days at play in the woods, sheltered at night in a cave filled with the discarded refuse of humanity (think The Black Stallion meets The Goonies). However, this wouldn’t be a summer movie without some narrative tension, and it wouldn’t be a Disney movie without some wholesome, well-intentioned, plucky, small-town intervention narrative tension. Along comes Bryce Dallas Howard as Grace, a forest ranger, instantly more believable than the thousand false notes she played as an opportunistic theme park executive in Jurassic World, fighting a losing battle against the foresting company owned by her own fiance Jack (American Horror Story‘s Wes Bentley – about as creepily cardboard as he always is). Pete’s curiosity about these Disneyfied people gets the better of him, he reveals himself, and, in a series of predictable plot points, Pete and Elliot are separated by (in order) hospital rooms, child protective services, and Jack’s skeezy, gun-loving brother Gavin (Star Trek‘s sparkling Karl Urban, who knows how to play a ridiculous cad without chewing too much scenery). Lowery borrows liberally from the Spielberg school of mid-80s family film-making, and Spielberg himself was beholden to an encyclopedic obsession with films of his youth. One might argue that every Spielberg children’s movie seems to be trying to right any emotional damage that Old Yeller may have caused a young Steven. Lowery even wisely sets Pete’s Dragon in a pre-cell-phone late 70s/early 80s (never completely defined), when a child would see nature with wonder and not as a backdrop by which to catch the latest Pokemon Go creature. Elliot, the dragon, is a marvel of movie design and animation, rarely exhibiting any of the jarring disconnects from reality CGI can sometimes cause – the work here is fluid and warm and fantastic and heartbreaking. Elliot never speaks and relays sensitivities the way a dog or cat might, through undulating body language and heavy sighs, sideways glances and guttural noises. Elliot is at once the film’s center and periphery, a guide and a protector yet also a victim of the cruel whims of serendipity and fate … which is pretty consistent with how humans treat any and all animals, in fact. And that is likely Lowery’s point. Robert Redford is cast as Grace’s father Meacham, the town eccentric whose claims of meeting a dragon in the woods decades prior have fueled a host of urban legends and have alienated him from all but the town’s youngest denizens. Early in the film, Meacham foreshadows what is yet to come with the line, “If you go through life seeing just what’s in front of you, then you’re going to miss a lot.” Toward the film’s conclusion, when it’s pretty damn evident there is a dragon living in the woods, Grace asks her father to tell her what really happened all those years ago. 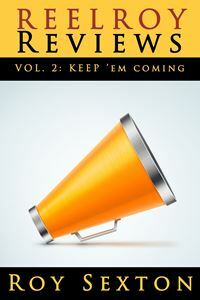 Meacham looks at Grace (after relating how Elliot hates guns … thank you!) and says, “I looked at that dragon. And he looked at me. And we were at peace. Something changed in me that day, and I could never look at you or any other creature the same way again.” Yeah, I cried buckets. Florence Foster Jenkins on the other hand may change the way any of us ever look at amateur singers or any other aspiring creative type again. Or not. Long before American Idol, people in this country treated singing competitions like gladiator sport. We applaud and cheer the Susan Boyles or the Kelly Clarksons who may defy our expectations with voices like angels, but we guffaw and leer at the William Hungs or Sanjaya Malakars for whom “pitchy” is the best compliment anyone can muster. We can be exceedingly cruel as a culture; the dark side of our Horatio Alger tendencies. The film, directed in workmanlike fashion by Stephen Frears (The Queen, Philomena), is a wartime snapshot of the title character’s days and nights as a wealthy patron of the musical arts in New York City and as a woefully untalented vocalist with a shockingly tin ear. Alas, as portrayed by Meryl Streep (Ricki and the Flash, Into the Woods), Jenkins comes off (no pun intended) as rather one-note. Not unlike an episode of the aforementioned American Idol, it’s unclear whether the filmmakers are making fun of Jenkins or celebrating her unabashed moxie. Maybe I’m a bit simplistic, but trying to have it both ways with a character who cuts a more tragic than comic figure could be mistaken for cruelty. In fact, Florence, (spoiler alert) on her deathbed, asks her dutiful (yet dubiously motivated) husband St. Clair (portrayed with surprising nuance by Four Weddings and a Funeral‘s Hugh Grant) if all this time everyone has been laughing at her. It’s intended to be a devastating self-realization. In fact, everyone has been laughing at her, including us. The film takes comic glee is showing how Jenkins’ simian-like vocalizations send audiences into apoplexy, so it’s a bit tough (akin to emotional whiplash) to suddenly invoke our sympathy after indulging our baser instincts. That said, the film is a pleasant lark with more sweet than sour at its core. Like the BBC production it is, the film is a clutch of fussy mannerisms and pop-eyed reaction shots. Streep is as hammy as we’ve seen her in years, if her Julia Child from Julie and Julia had spent a long afternoon with her Miranda Priestly from Devil Wears Prada. Grant does a fine job complementing and contextualizing Streep’s performance (partly it’s the design of his role as Florence’s major domo and consigliere), and there is a lot of joy in watching him out of love, sweetness, and survival clear one hurdle after another, shielding Florence from the worst of her detractors and hangers on. In hiring a new accompanist for his tone-deaf wife, St. Clair delineates to Cosme McMoon (a pleasantly neurotic Simon Helberg, playing a soft-spoken variation on his Big Bang Theory‘s Howard Wolowitz) some of the more eccentric rules of the house: “The chairs are not for practical use. They honor those who died in them. Are you fond of sandwiches? And potato salad? We have mountains of the stuff.” Grant’s delivery, a perfect blend of pragmatism, wonder, and self-interest, should have been the tone the entire film took. Regardless, if you are seeking solace from a summer move season filled with smart aleck mutants and half-baked sequels, frat boy comedies and nihilistic explosions, go check out the dragon (and Robert Redford) and stay for the potato salad (and Hugh Grant). 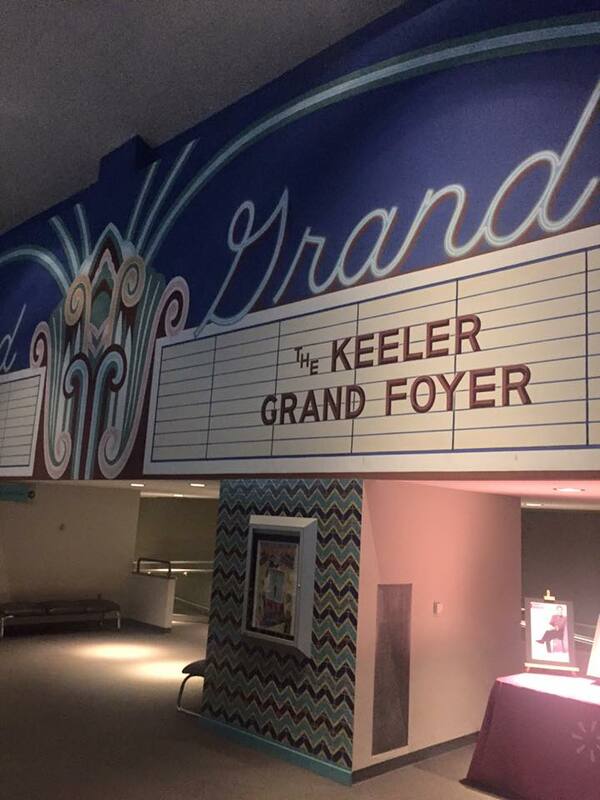 Bonus: If you missed this summer’s production of Xanadu, enjoy this video footage! 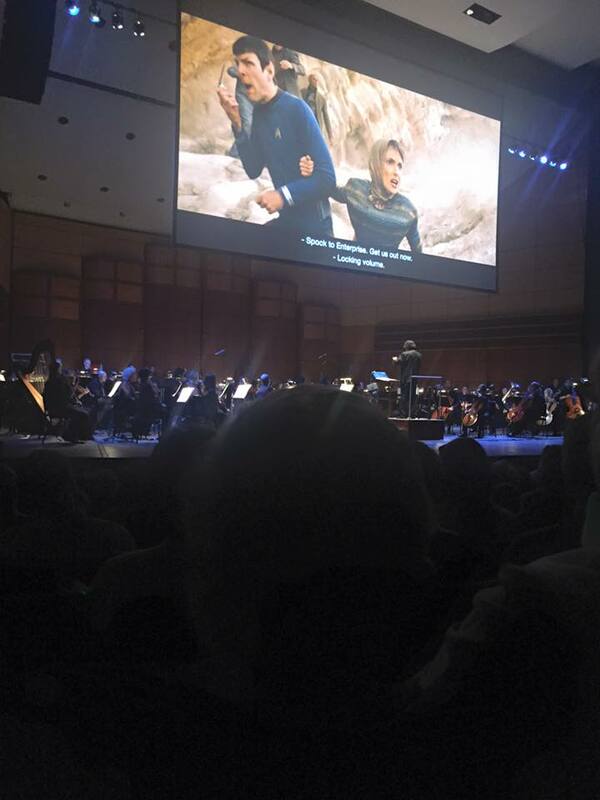 Star Trek: Live in Concert with the Grand Rapids Symphony … one part Marx Brothers, one part Royal Shakespeare Company, one part Buster Crabbe’s Flash Gordon. 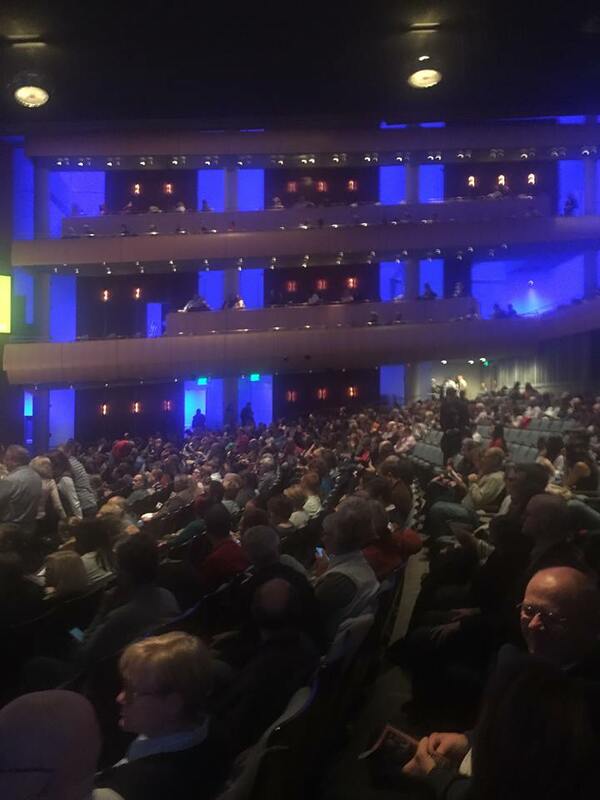 DeVos Performance Hall … or the U.S.S. Enterprise? Conservative, yuppified Grand Rapids is one of those places that, in my head, is the antithesis of anything a Ann Arbor liberal like me would, could or should enjoy (totally closed-minded of me … I get it). Yet, when you’re there, it’s all gleaming spires, clean streets, pleasant people (saw a LOT of “Ready for Hillary” and “Feel the Bern” buttons and bumper stickers, so I suspect my prejudices about the region are all kinds of wrong), and well-curated on-street art installations. It’s actually a very nice town. And the joy of watching a woman dressed in full Klingon regalia sitting right beside a snooty, Eileen Fisher-garbed symphony patron pleased every ounce of my soul. The performance itself was an amazing experience. For anyone who loves movies and music and appreciates the alchemic power when those two worlds collide, this presentation style is pretty epic and completely moving. 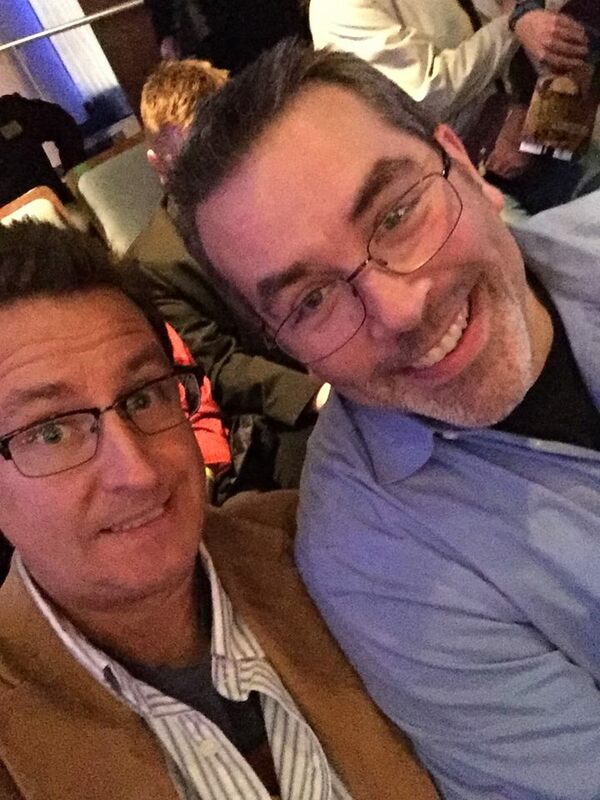 The Grand Rapids Symphony exhibited a precision and a coherence akin to the finest symphony orchestras (not that I’ve heard that many, but these guys are on point). 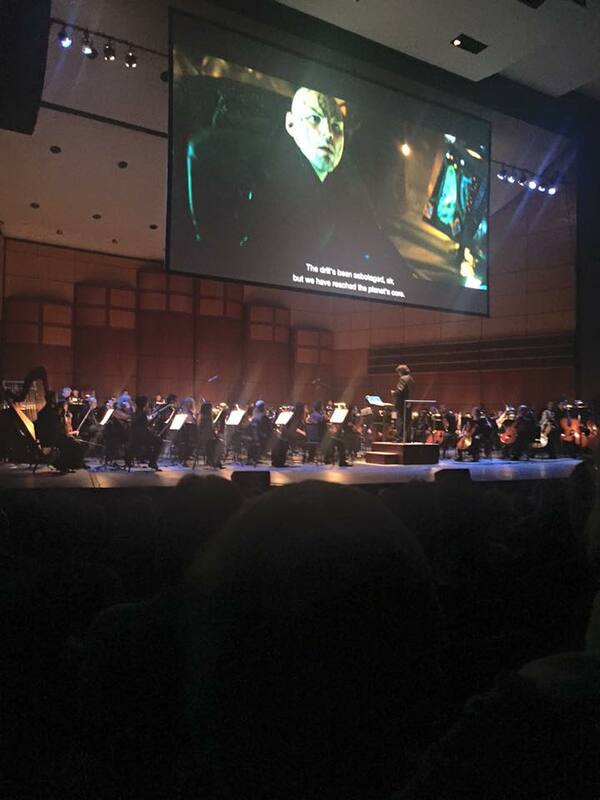 In fact, I rapidly forgot there was even an orchestra on stage (strange praise, I realize), as their fine work blended so seamlessly with the images and dialogue being projected on the screen. Likely, this kind of production is the closest any of us will come to watching an orchestra actually record the soundtrack for a blockbuster film. 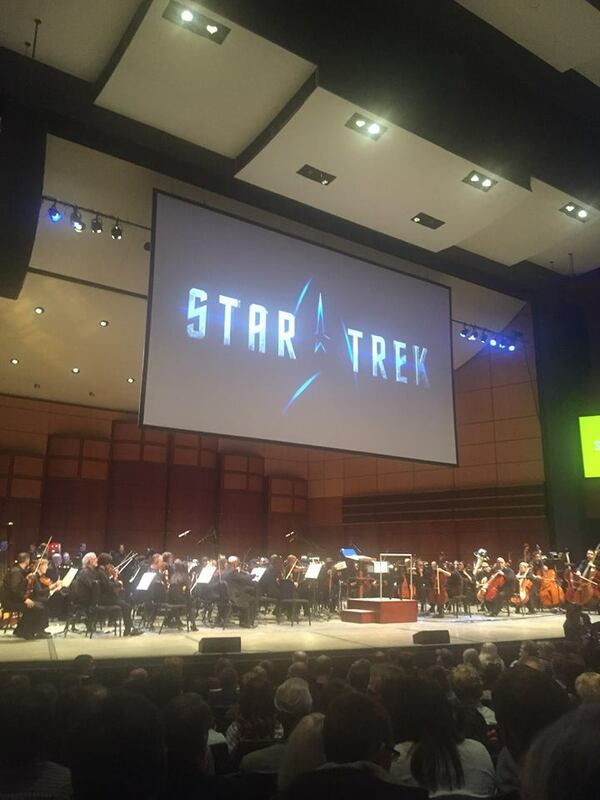 Star Trek‘s director J.J. Abrams, much like his inspirations George Lucas and Steven Spielberg and their legendary cinematic partnership with John Williams, has hitched his directorial star to a singular composer: Michael Giacchino. Smart fellow. Giacchino’s fusion of jazz-style sketches and orchestral bombast is as distinctive as it is compelling, an approach that lovingly augments and accentuates Abrams’ reverence for all the Gen X sci fi classics. Zachary Quinto as Spock … Winona Ryder as his mom? I had always had an appreciation for Giacchino’s work (The Incredibles soundtrack is a particular favorite), but, hearing his Star Trek score performed live, I was able to grasp more of its thematic nuance and playful fun (lots of great homages to the classic Star Trek Theme and other incidental cues). 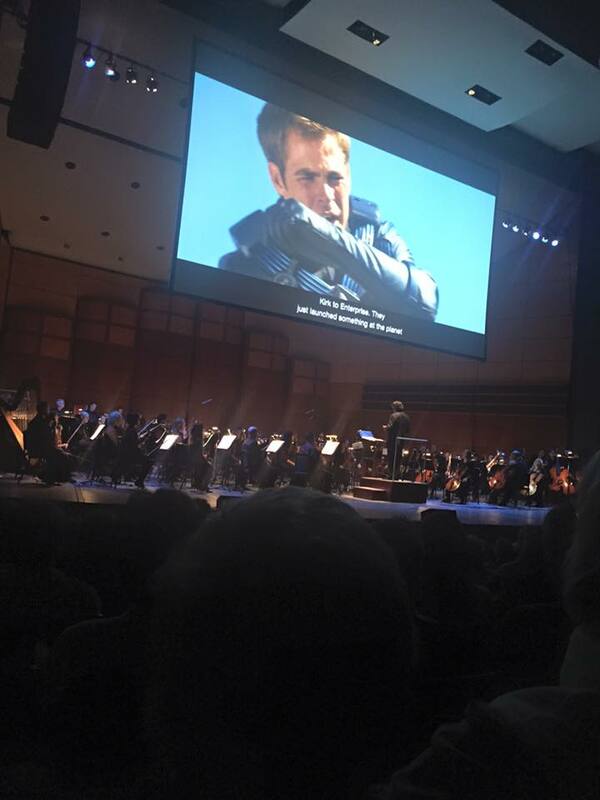 With the benefit of a live orchestra, there were colors and light between the notes that one fails to appreciate seeing the film in its original state. The copious talent of this symphony, guest-conducted by Constantine Kitsopoulus, coupled with their evident respect and delight for Giacchino’s sprightly work, made for a transporting experience. Oh, and the movie itself? That ain’t bad either. It’s been quite a while since I revisited this particular Star Trek installment, and, much like when I caught The Wizard of Oz again on the big screen at the Michigan Theatre a few years ago, I had an entirely different appreciation. Not unlike that 1939 classic, this film stands on its own, not just as fantasy, but also as a really funny, super-clever, swashbuckling comedy. Abrams and his exceptional cast appropriately genuflect before their source material but aren’t afraid to work in some winking criticism of the franchise’s cornier, paste-board legacy. Chris Pine (Kirk), Zachary Quinto (Spock), and Karl Urban (Bones) channel the hammier tics of their forebears, while bringing a rich inner life that their respective characters never enjoyed until this point. One part Marx Brothers, one part Royal Shakespeare Company, one part Buster Crabbe’s Flash Gordon. And it works beautifully. Watching the film again and enjoying Abrams’ kicky reinvention of these campy icons, I am now even more intrigued to see what he does with this December’s Star Wars: The Force Awakens re-launch. In fact, I was struck by how his Star Trek is a delightfully shameless swipe of Star Wars: A New Hope: a galactic madman (Darth Vader or Nero?) roaming the galaxy, astride a planet-destroying machine (Death Star or Narada? ), while a rogues’ gallery of rebellious do-gooders – sparky farm boy (Luke Skywalker or James T. Kirk? ), smart-mouthed neo-feminist (Princess Leia or Uhura? ), coolly logical mentor (Obi-Wan Kenobi or Spock? ), long-in-the-tooth scalawag (Han Solo or Bones McCoy?) – and their various comic sidekicks assemble to destroy the Big Bad and save the day. J.J. Abrams’ take on the socially conscious Star Trek mythos is much more Buck Rogers-esque escape than Communist Manifesto-commentary. And that may be why I enjoy it so much, so his version of Star Wars has my curiosity piqued indeed. Thanks to Lori Rundall for her thoughtful wedding gift of the tickets to see this provocative meld of cinema and live music. If you get a chance to take in such a show, I highly recommend it, regardless the film or the composer or the venue!